HomeTechnologyWhole Foods Cut Prices. It Saved Us 5 Cents. After buying Whole Foods in 2017, Amazon made a couple of bold pronouncements about lowering prices at the grocery chain. It made a third this week, saying that it was offering lower prices on hundreds of items, especially fresh produce, without going into much detail. It is also giving more special discounts to people signed up for Prime, the company’s membership service. “We will continue to focus on both lowering prices and bringing customers the quality they trust,” John Mackey, the chief executive of Whole Foods Market, said in an announcement. But we wanted to see for ourselves if a typical grocery bill would change much. To test the new prices, we selected a baker’s dozen of the types of items we buy all the time, not necessarily the fresh produce that would be the focus of the price changes. Eggs? Check. Milk? Check. Beer? How could we go without? We bought those groceries on Tuesday at the Whole Foods across the street from Bryant Park in Manhattan. Then, we bought the same ones at the same store on Wednesday, after the price cuts went into effect. We did not apply a Prime membership to either purchase. The result: We saved a nickel. The savings came from a small reduction in the tax charge, not any specific price change. Strawberries, the only produce we bought, actually got more expensive on our second trip — by 50 cents. But that change was offset by the cost of LaCroix, which had gone down by 50 cents. Whole Foods receipt from Tuesday. Whole Foods receipt from Wednesday. The pretax total for the bill was $53.98 both days. But on Wednesday, the tax charge was $1.61, compared with $1.66 on Tuesday, because the LaCroix is taxed and the strawberries are not. On Amazon’s Prime Now delivery app in Seattle, the price cuts were a little more noticeable. Whole Foods has some variations in its selection online, and in different states, so the basket was slightly different. The total order, including taxes and the suggested $5 tip, fell to $58.60 from $60.10, a 2.5 percent savings. The two-hour Prime Now delivery service — and the $2 off organic strawberries — are available only to Prime members, whom Amazon courts heavily because they spend far more. Whole Foods’s announcement trumpeted price decreases of 20 percent on average for the hundreds of newly reduced items, but the small financial impact in our cart should not come as too much of a surprise. For more than a year after Amazon bought Whole Foods, prices declined. In March, a basket of 60 items tracked by Morgan Stanley cost 7 percent less than March 2017, before the Amazon acquisition. Prices at typical grocery stores were down almost 3 percent over those two years. But like other grocery stores, Whole Foods has recently been facing stiff market forces, as producers feel pressures from bad weather, flooding and tariffs. That same basket of 60 items at Whole Foods was 2.5 percent more expensive in March than a year ago. 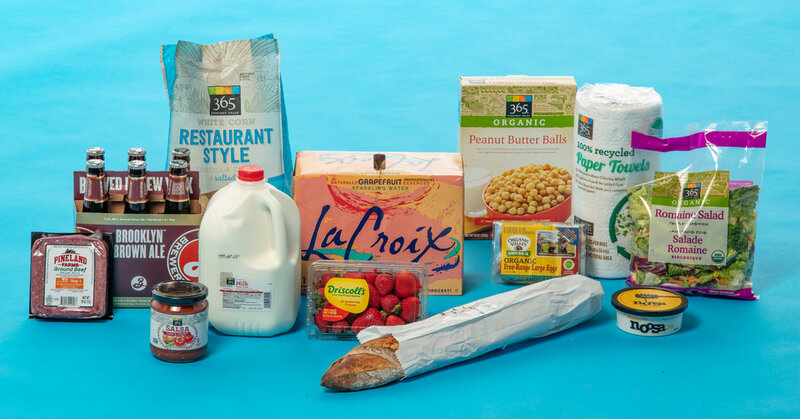 Grocers have been able to push some costs back to consumer packaged goods companies, but retailers have had to increase their prices too, said Phil Lempert, a food marketing analyst. “The money’s got to come from somewhere,” Mr. Lempert said. Whole Foods costs far more than mainstream competitors. Its prices were 15 percent higher than those at a typical grocery store, driven by a 30 percent premium on proteins, like meat, according to an analyst note from Morgan Stanley. Even excluding proteins, it’s almost 10 percent more expensive, Morgan Stanley wrote. Whole Foods has focused on giving discounts to Prime members, but Morgan Stanley said those were highly variable, based on the specific month and store. Sometimes, the Prime discount had a “negligible” effect on their basket of goods, though at one point in the fall, the discount amounted to more than 4 percent.